All Welded Plus lockers are a good choice when you need superior resistance to hard use and abuse. All of the components are welded into a single rigid unit to resist damage for the life of the product. Door frame and sides are 16 gauge. Backs, tops, and bottoms of each locker group are made from one piece of steel metal that spans multiple lockers. The doors are 14 gauge steel and have a 16 gauge continuous piano hinge riveted to both door and frame. Sides, tops, bottoms, and shelves are 16 gauge steel. Backs are 18 gauge. All welded Plus lockers are shipped pre-assembled. Groupings will be determined by WEC based on the floor plan drawings submitted with the order, maximum group width is 54”. This locker series is available in standard ventilation models with diamond perforated doors and sides or with solid side and doors with or without louvers. All accept built-in locks and padlocks and have rubber bumpers on the latch hooks to reduce noise. 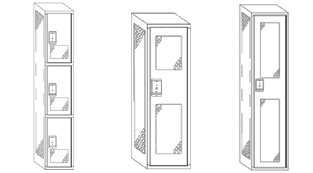 1,2 & 3 tier lockers have stainless steel recessed handle and multipoint latching with quiet latching channels. 4, 5, 6, 8 & 9 tier box lockers have a friction catch door pull. 2 & 3 tier lockers have welded horizontal frame intermediate cross members between the doors for added strength and security. 2.1 Material: Steel parts shall be mild cold rolled commercial quality steel, capable of taking a high-grade enamel finish. 2.3 Doors: 14 gauge steel formations are full channel shape on the lock side adequate depth to fully conceal the lock bar, channel formation on the hinge side, and right angle formations across the top and bottom.